I'm working hard to get caught up on my CQJP 2015 blocks! This is the block for April, finished at last! This is one of my favorite parts of this block. I love the round leaves and the effect the beads add to the flower heads! For the rick-rack seam, I used beads and French knots to hold it in place. 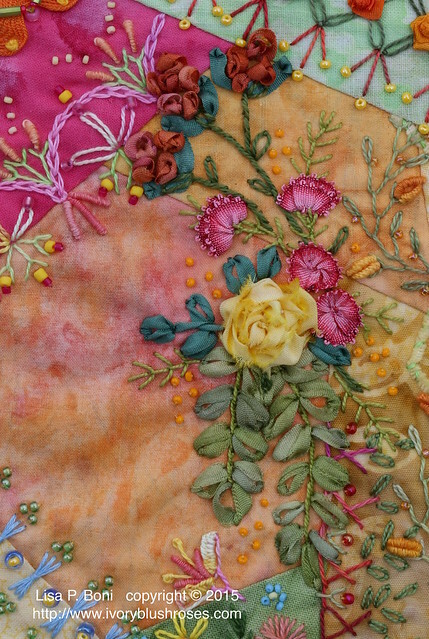 This seam is a mix of detached chain stitch, straight stitch and tiny Fargo roses made using 4 mm silk ribbon. The central motif is based off one I saw on Pinterest. I often sketch things I find that I like in hopes of modifying them to meet my needs. When I'm stumped, it's great to go to my stitch book for inspiration! Nearly always, anything I stitch ends up modified enough that it really doesn't look at all like the original. Here I used two different feather stitched seams. I love the way that they don't look anything like each other! 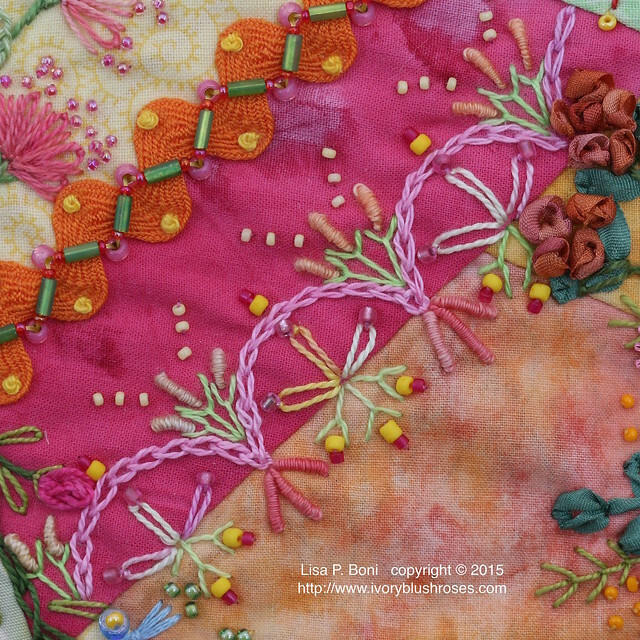 That's the beauty of Feather Stitch - it has so many possibilities! 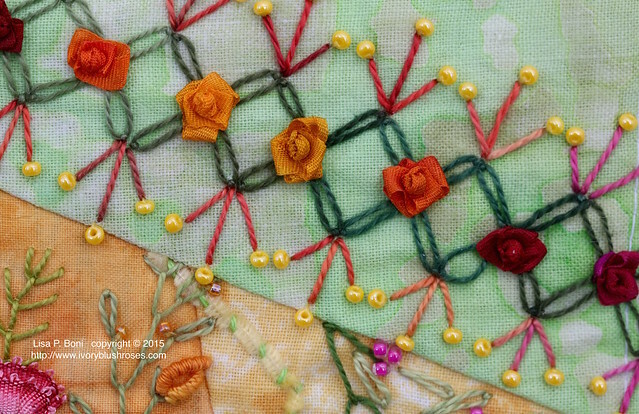 On the left, there is a crossed buttonhole stitch with detached chain stitch leaves. Oyster stitch is becoming another favorite stitch of mine. Here I stitched the pink flowers with a doubled thread to make them fatter. The base stitch is a barred chain stitch - one that was new to me. Thanks go to Sharon Boggen's TAST stitch archives for this one! 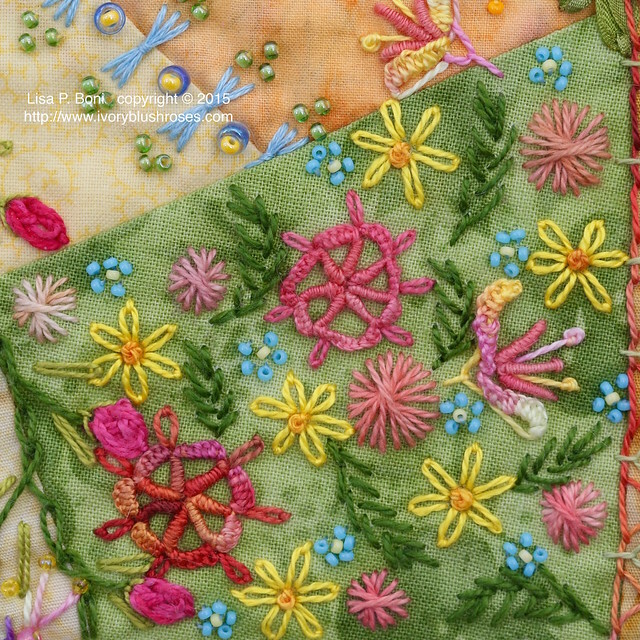 For the lower left corner, I used a tacked herringbone stitch with lazy daisy (detached chain) stitch leaves and straight stitch sprays. On this patch, I filled it with a variety of flowers. I can see from the photo that I need to go back and tack down the cast on stitching in the bullion flower wheels. I'm working on making my bullion stitches more consistent. I've still got a ways to go, but I'm getting happier with my results! On an open spot that needed filled, I added the pink daisy like flower spray on the left. This block was in need of a bit of blue stitching, so I added the sheaf stitched seam accented with beads. For me, this is one of those stitches that I must mark as they come out askew otherwise. Here are all four blocks so far! 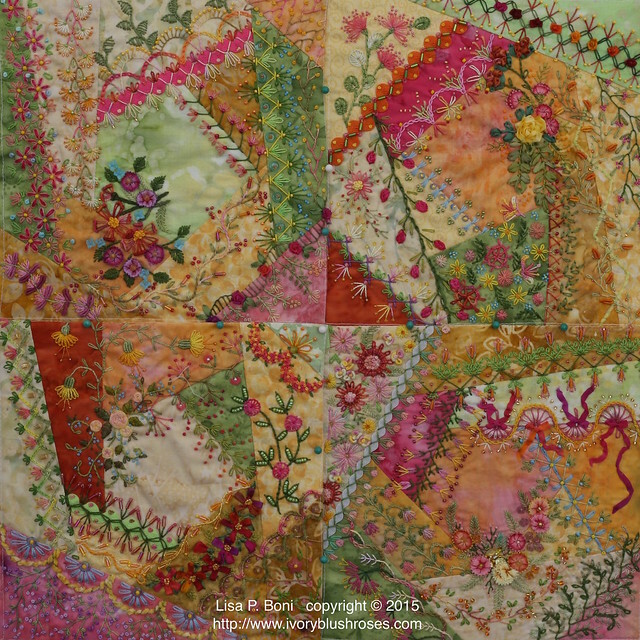 Starting to look like a crazy quilt! WOW!!!! I am such an amateur. 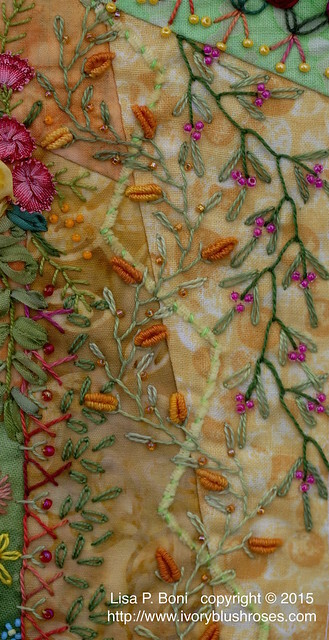 Your exquisite stitching really inspires me to keep learning. So lovely, Lisa! So much goes on in each block, it astonishes me! I wish that I had sat down beside you while we were in Lambertville to watch you work for a bit. It was a missed opportunity for me. 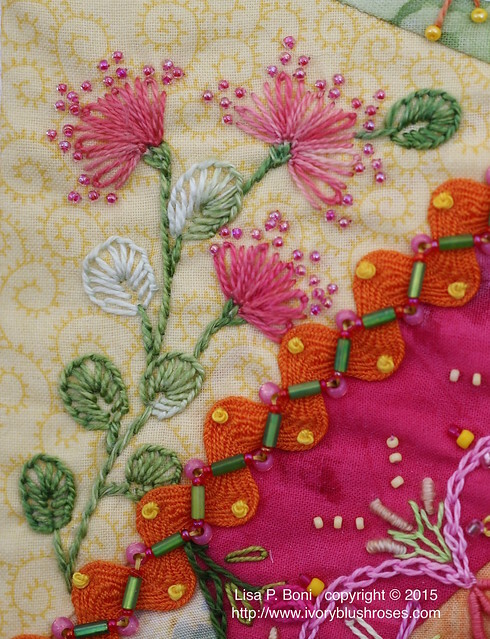 So many beautiful stitches, beads, flowers and colors. Wow Lisa, how beautiful! I don't see that you need any more practice on your bullion stitches, they look perfect to me, along with the rest of the block. I'd give anything for an ounce of your talent. Absolutely amazing! Your stitching is so inspiring. Thank you for sharing your art with us! Fabulous! 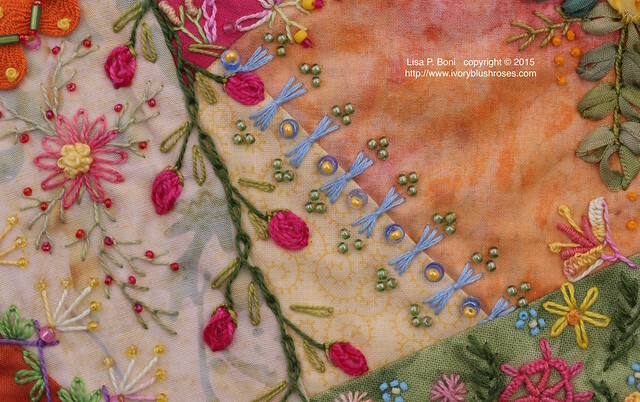 Love the colors,the stitching,and your sketch book is wonderful! I love the colours you're using - they're not ones I would have ever done on my own because I normally work in jewel tones, but now I've seen these I might just have to consider trying something new. Beautiful block!! I LOVE this block. 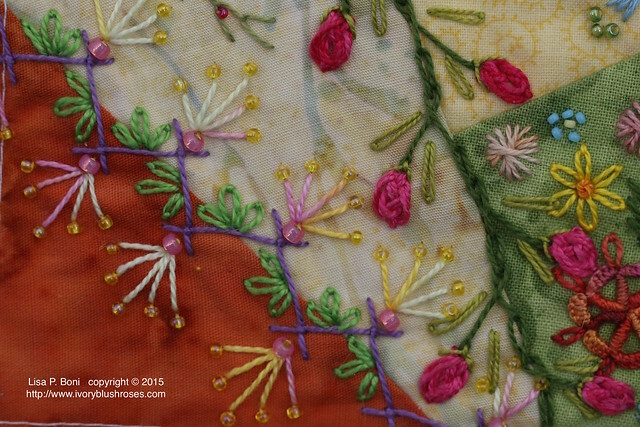 Everything about it sings to me, the fabric, the stitches, the riot of color. Thank you for sharing your talent and inspiring me to get stitching (after I finish my queen size scrap quilt). Love love love your beautiful stitching. This block is fabulous. Just recently started following your blog. 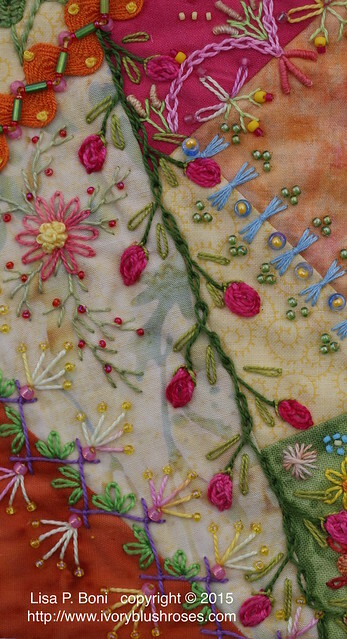 A question I have is this: I do a lot of my embroidery embellishments sort of free form, but some of them need more precise measuring and marking to make them "even". What do you use to mark your fabric. Your work is absolutely stunning! I do a lot of sewing and embroidery but I'm just in awe of these blocks. 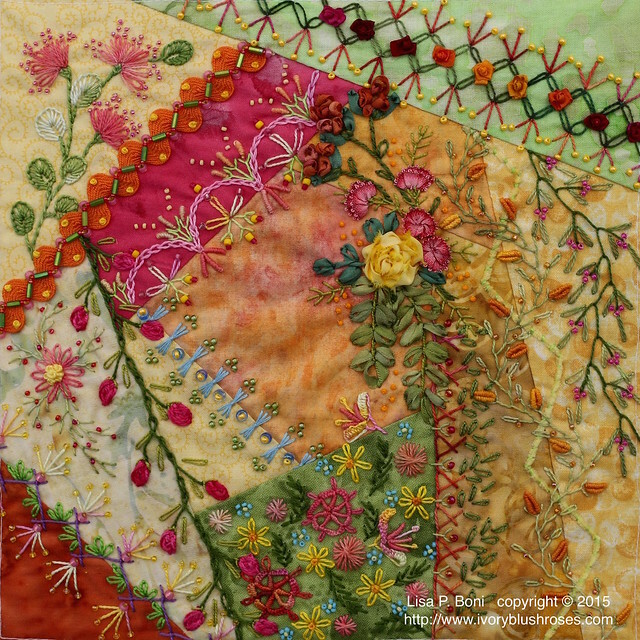 I love the bright colors and all the wonderful stitches. These are so very very beautiful! I am inspired!